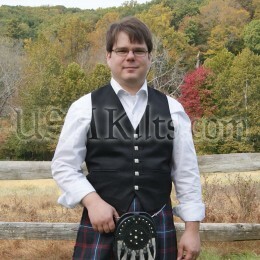 Piper kilt hose are not JUST for bagpipers! They were developed for and designed by pipers to be hard wearing and look good. Piper's hose are available in 7 colors, so it's easy to find the perfect match for your kilt. The diamond pattern at the top of the hose is similar to the "popcorn top" style, but it's more durable as they're knit as a single sock. As the top is integrated into the sock as a long turn over section, the overall length of the leg can be adjusted by turning the top over 2 to 3 times to meet individual length requirements. The top of the sock has a significant amount of stretch, fitting people with up to 19" (or so) calves. I only did the review so that I could comment on the fact that the socks come with a card inside that says "Care Instructions" and only has instructions on how to put on the socks. It says nothing about actual care or cleaning instructions! Though that was ironic!!! I bought these for my upcoming nuptials in February, but decided to field test them in Boston in early January, where the Saturday high was one (1!) degree. Kilt hose are typically worn pulled up, with the top stopping about 2 to 3" below the bottom of the kneecap. Also, note that they are "turned over" at the top. Elastic garters, called "flashes", are typically worn under the turned over top section to help keep the hose from falling down.